Bose gets smart with new voice-controlled speaker and soundbars range | What Hi-Fi? 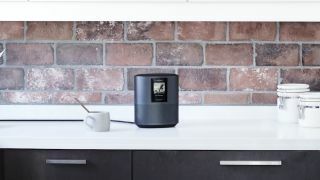 It's taken a while, but Bose has added its own take on voice-controlled speakers with the introduction of three new smart models, a desktop speaker and two soundbars. All three use Bose's proprietary microphone technology adopted in the company's headphones to make it easier for the speakers to hear voice commands when playing music at louder levels or standing further away from them. Eight custom-designed microphones are carefully positioned within each speaker to ensure accurate near-field and far-field voice recognition. Smallest in the range is the £399 Home Speaker 500, which uses two custom drivers pointing in opposite directions to reflect sounds of the surrounding walls. Bose claims this gives a stereo effect without having to pair two speakers as with other, similar systems. As well as voice control, you can also use the buttons located on top of the unit if you prefer. Initially the Home Speaker 500 and 500 and 700 soundbars ship with Alexa built in, along with Bluetooth and wi-fi. Google Assistant and AirPlay 2 compatibility are expected to follow in 2019. A small display can show album artwork and other information. If it's a boost for your TV sound you're after, then Bose offers the Soundbar 700 (expected price £800) and Soundbar 500 (£550). Functionality is the same as with the smaller speaker, and there's the same integrated microphone array. The Soundbar 700 is 2in high, 4in deep and 38in wide. It has a wraparound metal grille and glass top. Each soundbar uses Bose PhaseGuides technology which is designed to create a 'virtual' multi-channel sound effect, while Bose's DSP and QuietPort tech are combined to deliver "exceptional detail and crystal-clear dialogue", the company claims. The Bose soundbar 500 is smaller and thinner than its sibling, and has a matt finish. Both new soundbars include an HDMI ARC (Audio Return Channel) connection and proprietary AdaptiQ technology to automatically tune themselves to their surroundings. They can be paired with a wireless bass module and rear speakers to create a full 5.1 system.